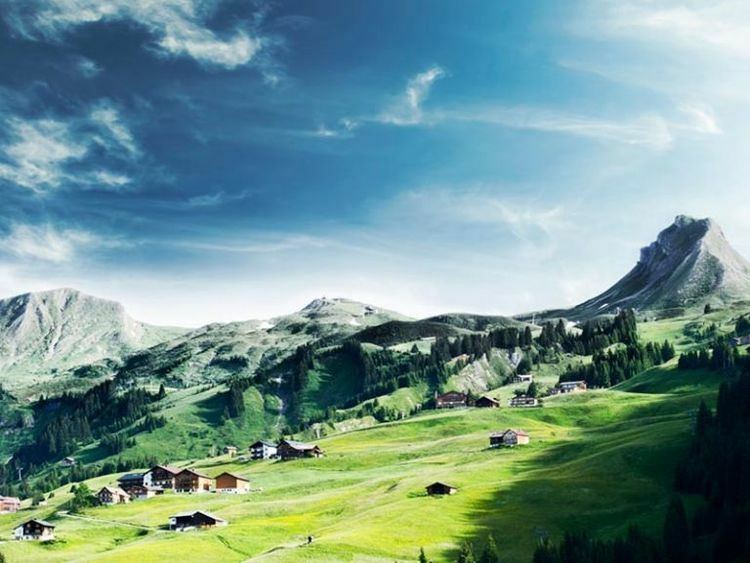 Vorarlberg ( [ˈfoːɐ̯ʔaʁlbɛʁk]) is the westernmost federal state (Bundesland) of Austria. It has the second-smallest area after Vienna, and although it has the second-smallest population, it also has the second-highest population density (also after Vienna). It borders three countries: Germany (Bavaria and Baden-Württemberg via Lake Constance), Switzerland (Graubünden and St. Gallen) and Liechtenstein. Vorarlberg is almost completely mountainous. It has a Germanic Alpine culture, quite different from the rest of Austria, and has been nicknamed the ‘Ländle’ meaning ‘small land’. The only Austrian state that shares a border with Vorarlberg is Tyrol to the east. The capital of Vorarlberg is Bregenz (29,500 inhabitants), although Dornbirn (48,700 inhabitants) and Feldkirch (33,000 inhabitants) have larger populations. Vorarlberg is also the only state in Austria where the local dialect is not Austro-Bavarian, but rather an Alemannic dialect; it therefore has much more in common culturally with its Alemannic-speaking neighbours Switzerland, Liechtenstein and Swabia than with Bavaria and the rest of Austria. The main rivers in Vorarlberg are the Ill (running through the Montafon and Walgau valleys into the Rhine), the Rhine (forming the border with Switzerland), the Bregenzer Ache and the Dornbirner Ach. One of the shortest rivers is the Galina. Important lakes, apart from Lake Constance are Lüner Lake, Silvretta Lake, Vermunt Lake, Spuller Lake, the Kops Basin and Formarin Lake; the first four were created for the production of hydroelectric energy. However, even before the dam for the power plant was built, Lüner Lake was the largest mountain lake in the Alps. Most of this hydroelectric energy is exported to Germany at peak times. At night, energy from power plants in Germany is used to pump water back into some of the lakes. As there are several notable mountain ranges in Vorarlberg, such as the Silvretta, the Rätikon, the Verwall and the Arlberg, there are many well-known skiing regions (Arlberg, Montafon, Bregenzerwald) and ski resorts (Lech, Zürs, Schruns, Warth, Damüls, Brand and many more). Lech is an exclusive ski resort on the banks of the river Lech. In recent years Lech has grown to become one of the world's premier ski destinations and the home of a number of world and Olympic ski champions. With some other neighbouring villages Lech created the largest connected ski area in Austria and one of the largest in Europe. Together these villages form the Arlberg region, the birthplace of the modern Alpine skiing technique and the seat of the Ski Club Arlberg. Lech is a popular holiday destination for Royal families and celebrities, for example Jason Biggs, Tom Cruise, Diana - Princess of Wales, and the former Queen Beatrix and the Dutch Royal family. Damüls is also recognized as the municipality with the most annual snowfall worldwide: on average 9.30 metres (30.5 ft). The highest mountain is Piz Buin, whose rocky peak of 3,312 m (10,866 ft) is surrounded by glaciers. Vorarlberg is supposed to enjoy the greatest scenic diversity within limited confines in the entire Eastern Alps; it adjoins the Western Alps. The distance from Lake Constance and the plains of the Alpine Rhine valley across the medium altitude and high Alpine zones to the glaciers of the Silvretta range is a mere 90 km (56 mi). Vorarlberg is divided into four large districts, from north to south: Bregenz, Dornbirn, Feldkirch and Bludenz. These districts appear on the automobile license plates in form of abbreviations: B, DO, FK and BZ. The economic expansion of Vorarlberg is "very positive and for the future rated more dynamic as for the other federal states"
In addition to the flourishing textile, clothing, electronics, machinery and packing materials industries of the Alpine Rhine Valley, there is also a broad agricultural base, especially in the Bregenz Forest (Bregenzerwald), which is noted for its dairy products (especially due to the "KäseStrasse Bregenzerwald", an association of farmers, restaurateurs, craftspeople and traders promoting the Bregenz Forest agriculture and its local products) and tourism. Another important economical and cultural factor is the three-level agricultural structure of the mountain-regions in Vorarlberg. It is also known as Alpine transhumance and describes a seasonal droving of grazing livestock between the valleys in winter and the high mountain pastures in summer. Many cultural habits like Yodel, Alphorn or Schwingen were developed during this time. This seasonal nomadism led to the rich culture, architecture and love for the nature in Vorarlberg. Moving the cattle to the high pasture and also retrieving them is always a big social highlight as the animals are richly decorated with flowers. The architectural curriculum in Vorarlberg has a strong reputation all over Europe. It has made a label for a demanding architecture of a fruitful confrontation between traditional construction and modern interpretation with the new Vorarlberg school "Vorarlberg". The Vorarlberg school is regarded as one of the most important pioneers of the New Alpine architecture. The independent architecture of the Bregenzerwaldhaus and the Montafonerhaus are particularly relevant to historical architecture. Arrivals are slightly higher in Winter (1.23 Mio in 2015) than in Summer (1.14 Mio in 2015). The real difference lies in overnight-stays indicating that Vorarlberg is a strong winter destination. Overnight-stays in Winter reach as high 5.11 Mio which is quite high when compared to Summer with 3.7 Mio overnight stays. The greatest tourist attractions are the mountains and the numerous ski resorts. In the cold season, winter sports enthusiasts will find ideal conditions for their favourite sport: skiing, cross country skiing, freeriding, snowboarding, ice skating, sled dog rides, carriage rides, tobogganing, snow and fun parks. Due to its unique location in the mountains it is also possible to cross Vorarlberg on skis. "Ski Ride Vorarlberg" is a combination of skiing, touring and freeriding and takes tourists from the Kleinwalsertal in the north to the Montafon in the south. The tour takes place in a small group and is accompanied by a guide. The route takes them through open terrain and on-piste ski areas – whatever is available. In the summer all mountain sports are in the foreground: hiking, mountain biking, trail-running, but also resting and boating on Lake Constance. Above all, Vorarlberg stands for cultural offers of all kinds: the Bregenzer Seefestspiele with its own lake-stage are the best known and for many years a cultural highlight. In addition, there are many museums and attractions such as the Kunsthaus Bregenz, the Vorarlberg Museum and the Jewish Museum. Prominent skiers from these regions include Anita Wachter, Egon Zimmermann, Gerhard Nenning, Mario Reiter, Hubert Strolz, and Hannes Schneider, as well as the ski-jumper Toni Innauer. The population of Vorarlberg is 388,711 (2017). The majority (86%) of residents are of Austrian-Germanic stock with a cultural connection with Switzerland and Liechtenstein to the west and Germany to the north. A sizable proportion of the population's ancestors came from the Swiss canton of Valais in migrations of "Walsers", including the Swiss French in the 19th century by invitation during the days of the Austro-Hungarian Empire.. There has been a sizable minority of Turkish descent since the 1960s. 78% of the population are Roman Catholic, which puts Vorarlberg in line with the national Austrian average of 73.6%. The second-largest denomination, with a share of 8.4%, is Islam. 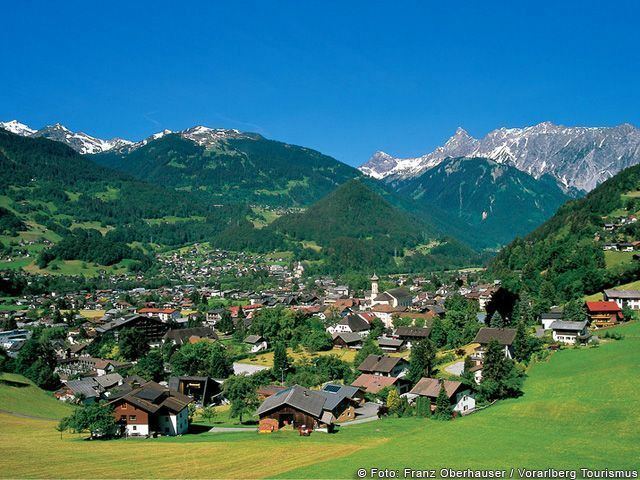 7,817 (or 2.2%) of Vorarlberg's inhabitants are Protestants. Owing to their location isolated from the rest of Austria, most people in Vorarlberg speak a very distinct German dialect that other Austrians might have difficulty understanding, since the dialects in the rest of Austria form part of the Bavarian-Austrian language group, whereas the Vorarlberg dialect is part of the Alemannic dialect continuum. Alemannic dialects are also spoken in Liechtenstein, Switzerland (as Swiss German), Baden-Württemberg, the south west of Bavaria and the Alsace region of France. The Vorarlberg dialect is further divided into a number of regional sub-dialects (e.g. that of the Montafon, the Bregenz Forest and Lustenau are some of the most distinct) which tend to differ considerably from each other. In fact even within these regions the dialects may vary from one town or village to the next. Before the Romans conquered Vorarlberg, there were two Celtic tribes settled in this area: the Raeti in the highlands, and the Vindelici in the lowlands, i.e. the Lake Constance region and the Rhine Valley. One of the important settlements of the Vindelici was Brigantion (modern Bregenz), founded around 500 BC. The first settlements in and around Bregenz date from 1500 BC. A Celtic tribe named "Brigantii" is mentioned by Strabo as a sub-tribe in these region of the Alps. The area of Vorarlberg was conquered by the Romans in 15 BC and it became part of the Roman province of Raetia. It was later conquered by Allemanic tribes in c. 450 AD. It then fell under the rule of the Bavarians and was subsequently settled by the Bavarians and the Lombards. It later fell under the rule of the Counts of Bregenz until 1160 and then to the Counts of Montfort until 1525, when the Habsburgs took control. 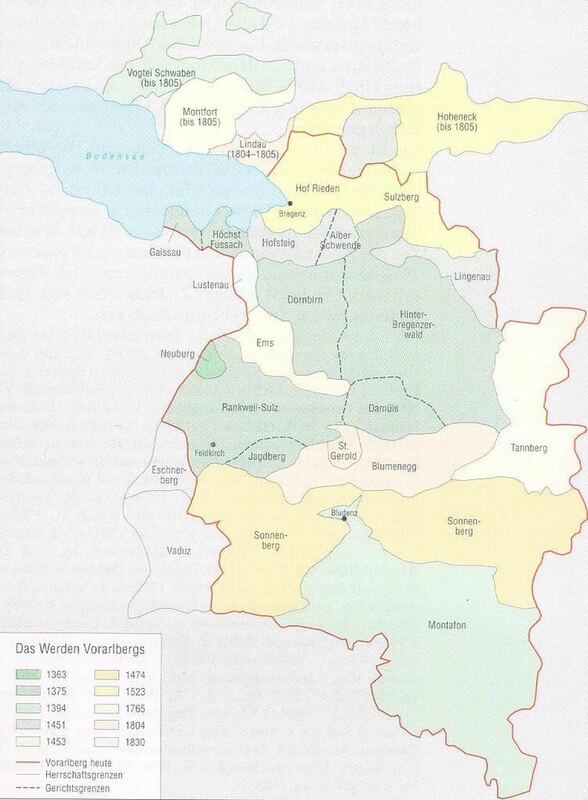 The historically-Germanic province, which was a gathering-together of former bishoprics, was still ruled in part by a few semi-autonomous counts and surviving prince-bishops until the start of World War I. Vorarlberg was a part of Further Austria, and parts of the area were ruled by the Counts Montfort of Vorarlberg. Following World War I there was a desire by many in Vorarlberg to join Switzerland. In a referendum held in Vorarlberg on 11 May 1919, over 80% of those voting supported a proposal for the state to join the Swiss Confederation. However this was prevented by the opposition of the Austrian government, the Allies, Swiss liberals, the Swiss-Italians and the Swiss-French. Following the Second World War Vorarlberg found itself occupied by French troops from 1945 to 1955, along with most of the federal state of Tyrol.